DRIFT EVO JOINS THE WELL-KNOWN DRIFT MODEL RAISING EVEN MORE THE STANDARDS TO SATISFY THE MOST DEMANDING SPORTY RIDERS. 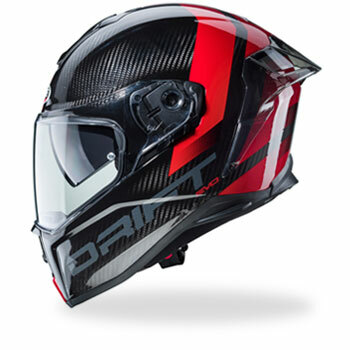 This helmet is the result of the experience gained by the company’s racing department and the riders who wear the DRIFT EVO in many championships. The shell is produced in 2 sizes (the small one from XS to M, while the bigger one from size L to XXL) that, together with an innovative inner lining, offer the perfect balance between comfort and fitting. The rear spoiler gives a sporty and aggressive look to the helmet, enhances the aerodynamics at higher speed and reduces the turbulences. As far as the inner lining, the cheek pads have been redesigned to offer a closer fitting; it is possible to change and install a different size to get a custom-correct fit. 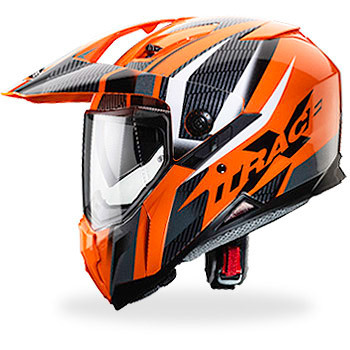 DRIFT EVO quick release visor mechanism allows visor self-adjustment to guarantee a close contact of visor and window beading. Thanks to the visor mechanism with a spring double movement, it will not be necessary to manually regulate it in order to avoid incoming of water or air. 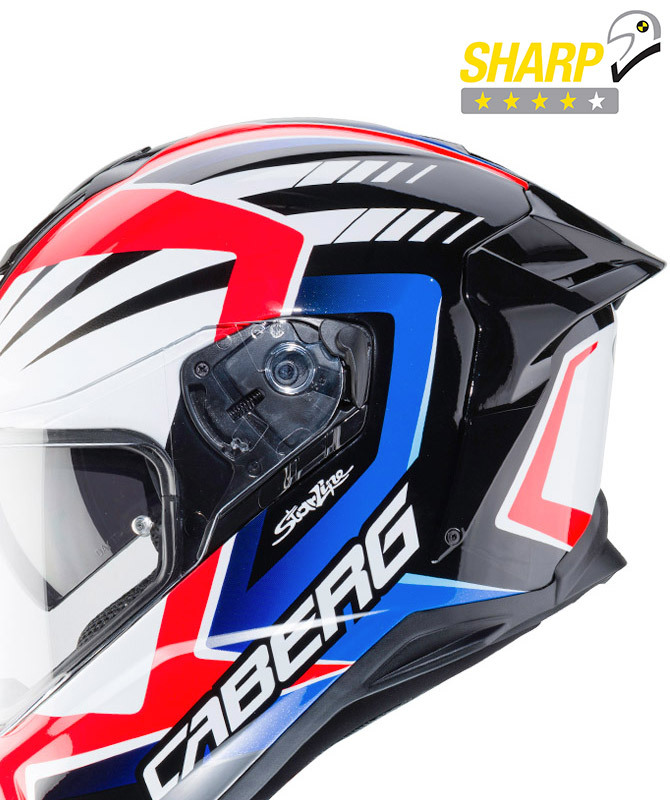 Moreover, the lever on the left side of the visor mechanism consents to stop the position of the visor at 0,5cm from the window beading to avoid or eliminate fogging, which is absorbed by the wind while riding even at higher speed. When the lever is lifted, the visor is locked to avoid sudden opening during a ride or fall. 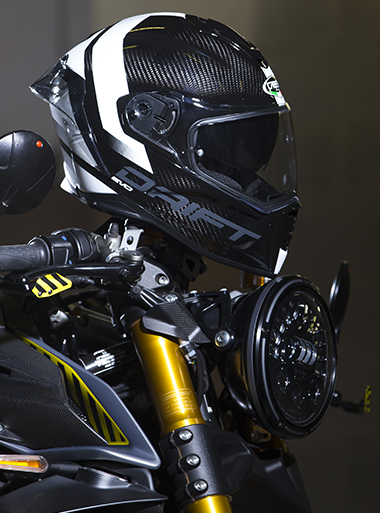 DRIFT EVO is also equipped with a transparent anti-scratch visor, an adjustable Pinlock lens Max Vision to avoid fogging, and an integrated anti-scratch sunshade visor DVT (Double Visor Tech) easily manoeuvrable with a lateral lever. The lower vent on the chin guard drives air directly to the inner side of the visor to avoid misting; the vent on top channels fresh air inside the helmet through numerous air grooves, while the rear vent favours the discharge of hot and stale air. DRIFT EVO is offered in the new solid colors Matt Black, White and in the new graphic versions INTEGRA and GAMA with composite fibre shell, as well as the SPEEDSTER version. It’s available also the CARBON version with a shell entirely in carbon fiber that weighs less than 100 gr. compared to the composite fibre version. There are 3 color combinations for the SPEEDSTER graphic version, 2 for INTEGRA and CARBON, and 1 for GAMA. All the versions are equipped with removable and washable lining including the padding on the chinstrap; double D-ring for the retention system and ready to install most of the communication systems present on the market thanks to the space dedicated to speakers and microphone. 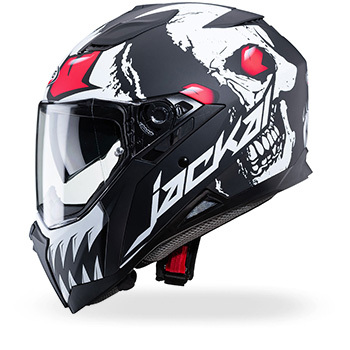 WARNING: This helmet is not homologated for use in the United States of America and Canada. 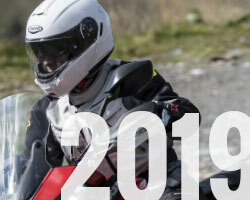 The helmet has been homologated according to the European Standard requirement ECE 22.05; therefore the use of this helmet is allowed only in the countries/nations where the homologation standard ECE/ONU 22.05 is in force. Models may vary and not be available in all markets. As part of its policy of continuous product improvement, Caberg reserves the right to change the specifications of its products in the light of new technologies or to meet the needs of the homologation standards.